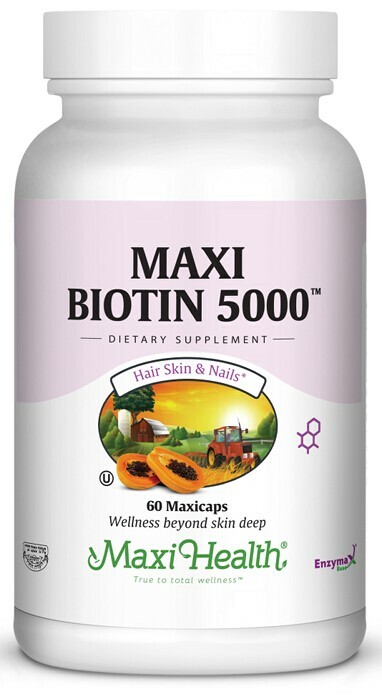 With Maxi Biotin 5000™ you now have a standalone source of biotin in the Maxi Health supplement family. Biotin supports the use of the B vitamins and the synthesis of ascorbic acid. Biotin also supports enzymes that aid in the metabolism of proteins, fats, carbohydrates and carbon dioxide, circulation and healthy skin. Microcrystalline cellulose, vegetable cellulose (capsule), vegetable magnesium stearate, Enzymax® (calcium carbonate, bromelain, papain, lipase, amylase, protease, silica). Enzymax®, a vital digestive enzyme complex is a registered trademark of Maxi Health Research® LLC.